Pre-opening of the deLight sustainable light-art festival with a.melodie by Mélodie Melak Fenez and AtomTone by Jiří Suchánek. a.melodie consists of self-made synthesizers that are hooked up to an array of plants. The plants, who have their own unique timber, shape the sound of each oscillator. Because of physiological reactions, the plants modulate the frequency they produce, creating an alive and ever morphing sound. On stage, a.melodie composes with the sounds produced and modulated live by the plants. Her sonic image evolves from minimalism to noise drone. Through the use of technology, she puts sounds where she cannot put words, in her interaction with vegetal elements. 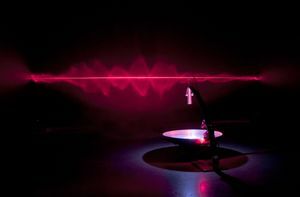 AtomTone is an experimental project based on sonification of atomic data. Exact light frequencies of atomic spectra lines are recalculated into sound frequencies. Each element has its own specific spectral chord with which I am further working and shaping with buffering, filtering, waveshaping etc. The shows take place in Spektrum during a pre-opening of the deLight sustainable light-art festival which will last until March 27. deLight is an environmentally-oriented light-art festival promoting sustainable lifestyles through contemporary art: we are establishing a new form of communication between eco-institutes, eco-initiatives, and audiences.